I'd like to start by looking at the chapters for the documentary part of the DVD, featured on Disc 1. It would be easy in this review, to pick apart the Top 25 Rivalries in terms of the list of rivalries it presents, picking my own top twenty five and giving reason why each rivalry presented on this disc should be higher or lower, or why it doesn’t deserve to be on the disc. However, for the most part that is not what I am here to do. It must have been an incredibly difficult list to compile, as it not only has to look at making sure people’s most memorable rivalries are nearer the top of the list, it also doesn’t want include to my rivalries from around the same time period or involving the same competitor to close together. Therefore this set is to be commended for it’s placing of the rivalries, as well as looking at number of different promotions and eras, when it would have been easier to simply look at WWE, the only era that doesn’t get a mention on this set is WCW, which would seem to be a big overlooking, also it would have been nice to see a female rivalry make the set, I’m sure Trish Stratus vs. Lita would have fit onto the list nicely, to cover all bases. The set is presented by Renee Young, who appears on the likes of Bottom Line and Experience, she does as good a job as she can with the material she is presented with, which in truth is abysmal. The DVD is held down by a bizarre chemistry idea that is present throughout. Renee teaches us a number of facts about chemistry in between every few rivalries on the list, I say she teaches us, she reads to us as though it is story time. It’s clear the Young has very little knowledge of the subject she is talking about, not only the chemistry element but a times the wrestling stuff as well. Luckily these segment are kept to a minimum, but you may be screaming at your television for them to end, if it gets too bad reach for the remote control. In a nice twist, each rivalry has a single talking head giving comments on the rivalry instead of the usual five or six. This gives each rivalry it’s own individual feel and the fact that each talking head either had something to do with the rivalry or is heavily linked with both sides of the feud, gives a much closer insight into what was happening at the time. Whilst most of the talking heads are obvious ones, it’s the slightly off field interviews that make for the best viewing, such as CM Punk discussing Randy Savage vs. Hulk Hogan or Bret Hart discussing Brock Lesnar vs. Kurt Angle, these are people who watched the rivalries as a fan and therefore give the best insights on how the rivalries effected the viewing audiences. Some of the interviews don’t quite come off as good though, with Ted DiBiase Jr. discussing Hulk Hogan vs. Roddy Piper and The Miz discussing Steve Austin vs. The Rock standing out as not quite seeming big enough stars to discuss the rivalries they are handed. It would have also been nice to see a few honourable mentions included as extras on Disc 1 as we’ve seen in previous countdowns, which really would’ve rounded out this Disc nicely, and possibly even allowed for a few more comedic rivalries to get an airing. Choosing the matches for these types of sets is another difficult ask, because the matches chosen needs to be able to typify the rivalry that is being presented, however a lot of this ground has already been covered in a number of other DVD sets meaning the best matches have already been taken and nobody wants a set full of repeats. (The only match that sticks out as a major repeat is the “Winner Take All” Ladder Match which I’ve seen on at least two others sets over the last few years.) Therefore we get a number of interesting choices in terms of matches, such as the Rebellion contest between Stone Cold and The Rock as well as the less famous King of the Ring match between The Undertaker and Mankind. When scanning down the match listing the thing that stood out most for me was that the matches stop in 2006, and entire seven years before this set was released. I realised that everything post 2006 was included a part of the Blu-Ray exclusive content, that includes Shawn Michaels Tribute to The Undertaker from a 2009 episode of WWE Smackdown, Triple H, Batista & Shane McMahon vs. The Legacy from WWE Backlash 2009 and John Cena vs. CM Punk for the WWE Championship from WWE Night of Champions 2012. Not having the matches on the DVD come up to the modern day, certainly doesn’t allow for the type of finality you want after watching almost nine hours of footage, and although I can see the reasoning for having this content on the Blu Ray to encourage buys of the product, this should not come at the detriment of the other product. One match that seems ripe for the cull to allow for space, would be the Abdullah the Butcher vs. Bruiser Brody match, whilst by no means being an awful match, WWE holds so little footage of the rivalry that we’d already seen most of this match, including the ending, in the video package shown for the feud. My Top Three Matches on the Set. 1. Brock Lesnar vs. Kurt Angle from WWE Summerslam 2003. 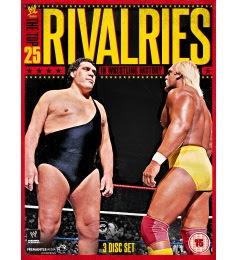 If you want a brief look at a number of different rivalries that shaped wrestling history then this is the set for you, if you’re looking for something a bit more in depth then prepare to be a little disappointed. Whilst each rivalry gets around seven minutes, it’s clear that there is a lot more to say about each with some rivalries going on for years meaning some elements are scanned over. If you’re after rare appearances from a number of ex-WWE talent, such as Vince Russo and Shane Douglas, this is also the place to be. You can’t imagine a lot of the talent interviewed getting as much time to talk in any other setting or disc and it truly is a pleasure to spend some time with some of these lesser seen stars in 2013. If you haven’t got a Blu Ray player. Yes, the majority of the content is on the DVD set, but with the matches ending in 2006, if you’re anything like me you’ll be looking for a final ending with the set being brought bang up to date. The John Cena vs. CM Punk match certainly would have done this for me and probably would’ve made it into my top three list. This DVD is currently available to order now from www.wwedvd.co.uk , as well as all good DVD and Blu Ray retailers.